Highly efficient 3V cathodes for rechargeable sodium-ion batteries have been developed by users from Argonne National Laboratory's Materials Science, Chemical Sciences & Engineering, and X-ray Sciences Divisions, as well as the University of Chicago, together with the Center for Nanoscale Materials NanoBio Interfaces Group. With a near-theoretical capacity of 250 mAh/g, excellent rate capability and cycle life, and high energy and power densities of 760 Wh/kg and 1200 W/kg, respectively, these bilayered V2O5 systems can be used in applications at ambient temperature. This research team's approach to achieving sodium ion intercalation was to use nanoscale materials that have two-dimensional layered structures with adjustable interlayer spacings capable of accommodating large volume changes. Ex situ and in situ synchrotron characterization studies revealed that sodium ion uptake induces organization of the overall vanadia structure together with appearance of long-range order between the layers. Upon deintercalation of sodium, the long-range order is lost while the intralayer structure is still preserved. Inducing ordering of nanomaterials in operando has thus allowed the realization of the highest possible electrode capacity by optimizing the balance of electrostatic forces. 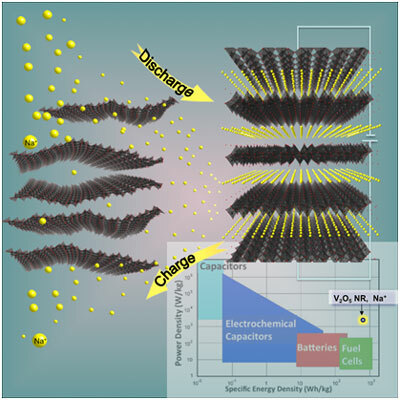 Improved elasticity and exceptional long-term stability of this open framework structure makes bilayered V2O5 a suitable cathode material for high-energy density rechargeable sodium batteries.